DynoTune Product, 907-6AN Nitrous Bottle Nut with Washer Blue - DynoTune, Nitrous systems, Purge kits, Nitrous Bottle heaters and more! 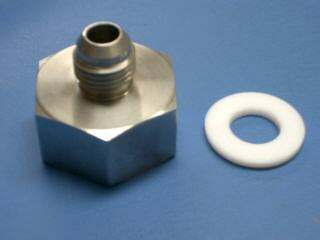 6AN Nitrous Bottle Nut with washer. Mounts to your nitrous Bottle and Comes with a teflon washer. Fits standard CGA 660 valves like DynoTune, NOS, etc.. 6AN size is what you want for race kits kit up to 400HP. Note, color will be blue!